Miniature Schnauzers etc. : Shazzam Of Oz Something Else "Sammy" goes back to show circles! Shazzam Of Oz Something Else "Sammy" goes back to show circles! 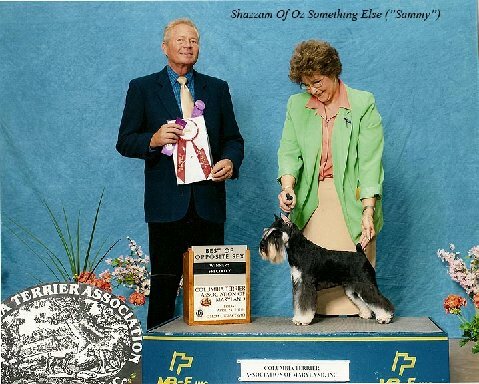 This morning I got a very familiar e-mail from my dear friend and handler, Carol, stating then an hour later my dog need to be entered at her first spring show cluster.... I spend about 20 minutes jumping from one show site to another and Boom - done - she is entered for her first show weekend. have some beautiful babies later on this season. Good luck, Sammy and Carol! One day from the life of our "Little Rascals". 5 weeks update on growing puppies.